Saskia Renton is the 2006 top Common Entrance student. She secured a 92.78 percent average, with 95 per cent each for Maths and English and 88.33 in General Paper. She exceeded her expectations: “I was trying to aim for the top ten,” she mentioned. 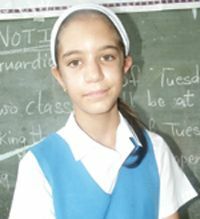 Saskia lives in the Central Leeward Town of Layou with her father John, a teacher at the Girls’ High School and mother Susan, a Marine Biologist.